While Amourok is in full swing, we certainly do not wish to forget Sir Heart's Day! A common ritual of the day includes exchanging cards with those we care about, whether they be a partner, friend, or family. In the true spirit of the day, we challenge you with this punny card contest! 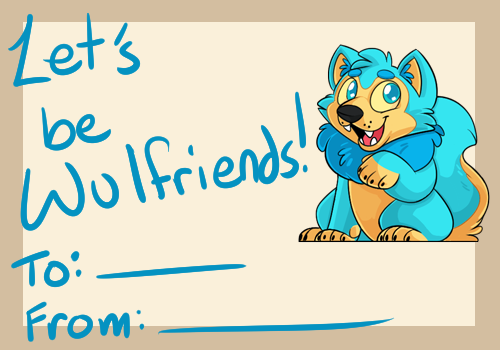 Design a friendly (and perhaps groan-inducing) card to send to your fellow Terrafrostians. An example of the type of thing we are looking for is above -- a simple 1-sided "card," displayed with at least 1 image of some kind, that expresses a nice message. Including a pun of some kind is recommended but not strictly required! 1) All work submitted must be your own. You cannot ask another User, a friend, or a family member to make the image for you. You may use official IcePets images (edited or not) for your entry. 2) The contest is held anonymously. Showing your artwork to other Users during the contest will disqualify you from the contest. 3) Your image must be uploaded and sent to Quil by February 21st, 23:59:59 (IcePets time). It does not matter where or how you upload it. Your submission will count as long as it is sent to Quil within the time frame. 4) The contest is limited to one entry per User. 5) All entries submitted must be considered appropriate under the Terms and Conditions of IcePets. On February 22nd everyone will get to vote for their favourite entries! You only get one vote and voting will be completely anonymous. I am going to try! I'm not artsy, but ti's a really nice idea. Go for it Terrafrostians! Ohhhhh It's look really fun! I will try to do something! Is there a size requirement? @Varyntha Nope! Just make sure it's big enough that we can read the text! Probably try to keep it under like... 1000px or 1500px max, or we may have to shrink it down a bit.